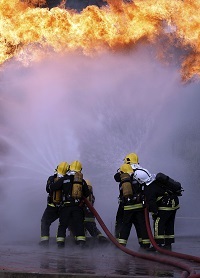 Northern Ireland Fire & Rescue Service (NIFRS) is providing an outstanding emergency response to the people of Northern Ireland, according to two recent public surveys. The Special Service Incident Survey showed that 100% of respondents felt that the quality of service provided by NIFRS during an emergency incident met or exceeded their expectations whilst in the Emergency Response Survey 99% of people felt the same. NIFRS surveyed members of the public who required Firefighters to attend a fire (through the Emergency Response Survey) or a Special Service Incident (including flooding, specialist rescues, animal rescue etc) over a 6 month period in 2015/16 to rate levels of satisfaction on the operational service they received. Michael Graham, Assistant Chief Fire Officer, Northern Ireland Fire & Rescue Service (NIFRS) said: “The results from these surveys are superb and underline the high operational standards and service that we continue to provide to the people of Northern Ireland. “I would like to commend our workforce –our Firefighters, our Regional Control Personnel and our Support Staff who all work tirelessly to protect our community and provide an exceptional emergency response. 100% of respondents agreed or strongly agreed that their contact with the Regional Control Room (999 emergency call handlers) was polite, while at least 97% was achieved in relation to being helpful, efficient and reassuring. 94% of respondents felt that the Fire Appliance arrival time to the incident was as expected or quicker than expected. 100% respondents felt that Firefighters were polite, helpful and efficient with 99% stating they were sensitive and informative. 99% of respondents felt NIFRS kept the effects of the incident to a minimum. 100% of respondents felt that the quality of advice they received at the incident was easy to understand, informative, helpful and relevant. 100% of respondents agreed or strongly agreed that their contact with the Regional Control Room (999 emergency call handlers) was polite, helpful, efficient and reassuring. 100% of respondents felt that the Fire Appliance arrival time to the incident was as expected or quicker than expected. 100% of respondents felt that Firefighters were polite, helpful, informative, efficient and sensitive with 96% stating that the effects of the incident were kept to a minimum. 100% of respondents felt that the quality of advice they received at the incident was easy to understand, informative and helpful.